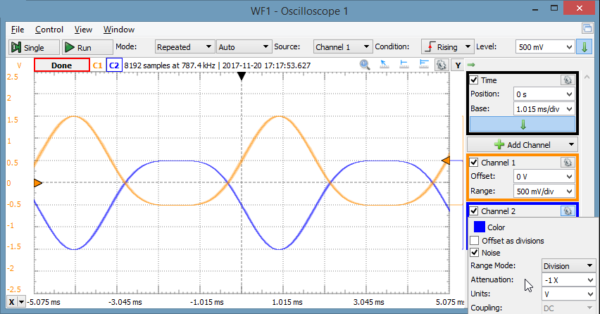 WaveForms (previously WaveForms 2015) is the software interface that controls the Analog Discovery 2, Digital Discovery, and Electronics Explorer Board, providing access to all of their bench-top tools. 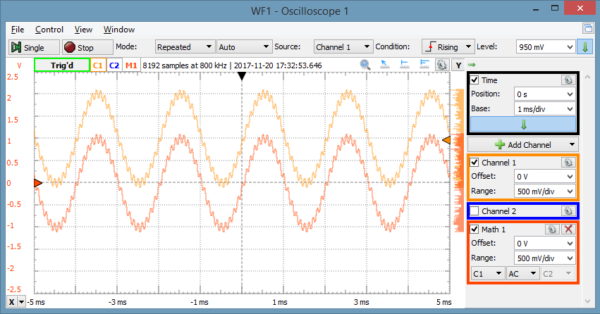 We posted an updated version of WaveForms, version 3.7.5, which is available for download on the Digilent Wiki. 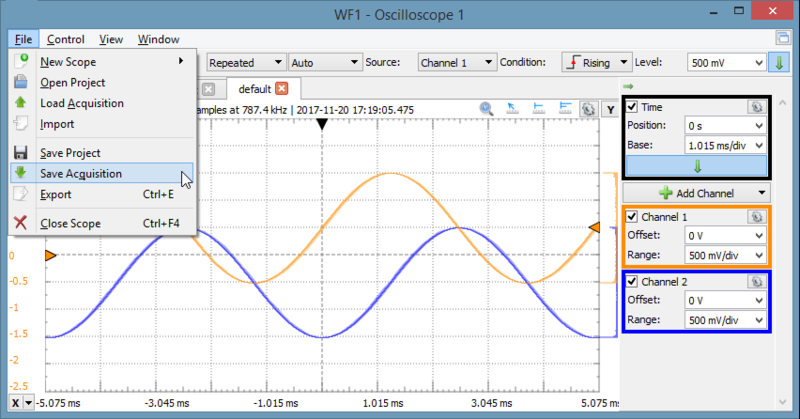 This new version of WaveForms includes some bug fixes and some new functionality to existing tools! 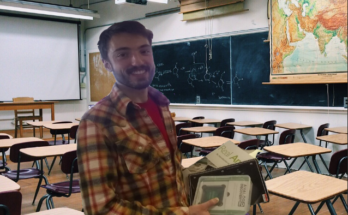 If you want to know what version you have, check out this post. 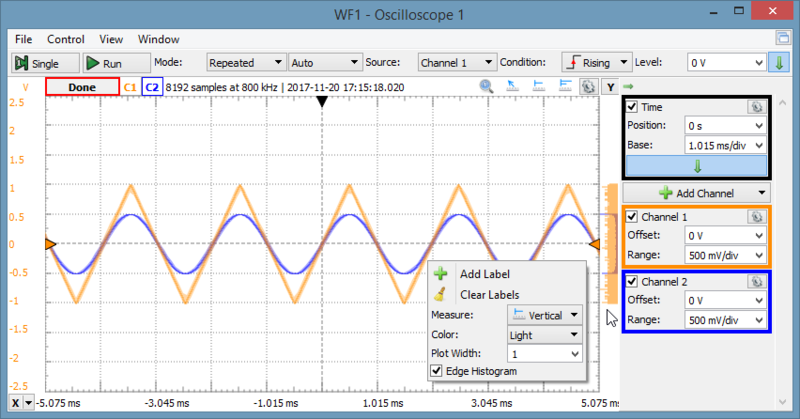 In the Oscilloscope tool, the view menu allows you to add many different plots of the Acquisition and add additional functionality to the Oscilloscope window such as an XY plot, Persistence, and cursors. In addition to adding the Histogram View in the view menu, you can now also add an Edge Histogram to the plot by checking the “Edge Histogram” box in the gear menu on the Oscilloscope plot. 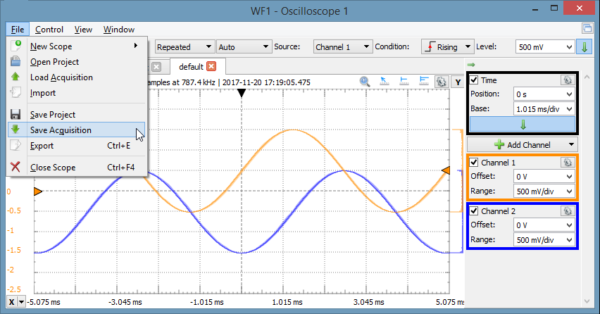 Another feature in the view menu is the zoom window, which gives you a zoomed in version of a portion of the Oscilloscope plot. Quick measure has now been added to the zoom window, so you can take measurements in both the regular and zoomed views. 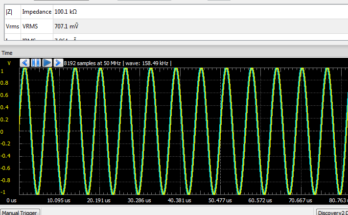 In addition to attenuation by 0.1X, 1X, 10X, and 100X, the Oscilloscope channels can now be negatively attenuated for data inversion. 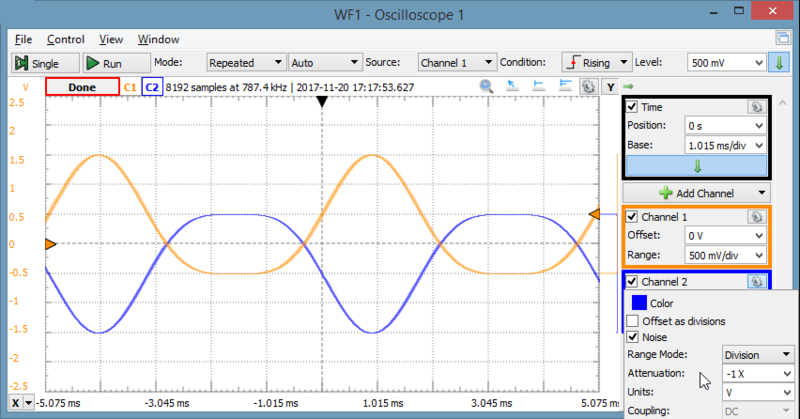 The Simple Math channel allows for simple manipulation of the Oscilloscope data including addition, subtraction, multiplication, and division. In addition to these basic operations, the Simple Math channel also has an AC and Offset option. In the Oscilloscope tool and the Logic Analyzer, saved acquisitions can now be loaded into separate tabs for reference. 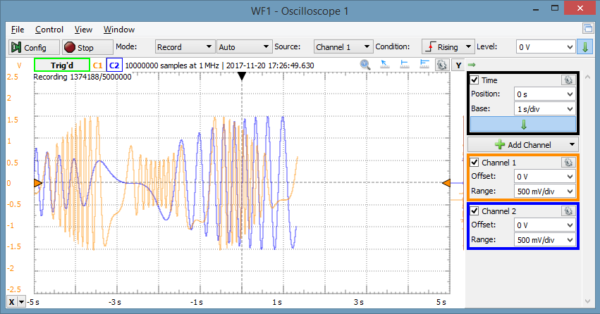 The Oscilloscope and Logic Analyzer tools can now operate in Record mode in the background. 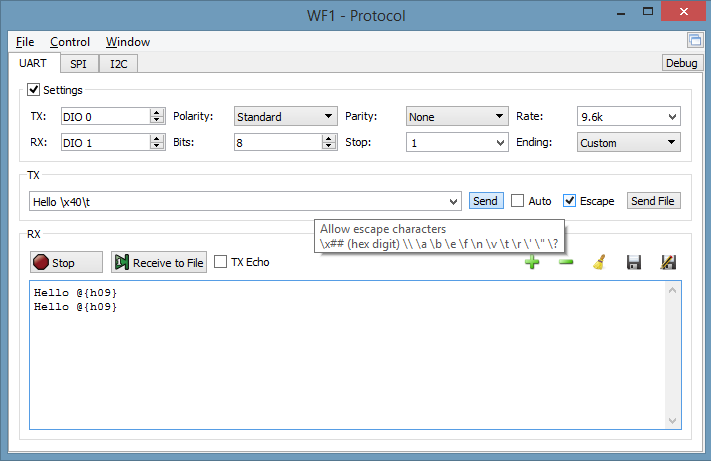 The Protocol Analyzer UART tab allows transmission and receiving of UART data, which can now include custom endings and escape characters. The Pattern Generator has added the Auto Run option, which is based on the longest signal or bus period. Every update to WaveForms includes some amount of bug fixes. You can view some of these in the full change log, or ask on the Digilent Forum. 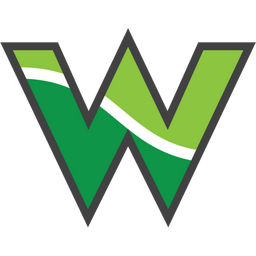 You may have already noticed that in this post and on the Wiki the name WaveForms 2015 is no more. The entire WaveForms suite including WaveForms 2 (Previously WaveForms Original or Legacy) and WaveForms 3 (previously WaveForms 2015) will be referred to as WaveForms. There are two ways to tell which version you have. The most detailed is the version number. 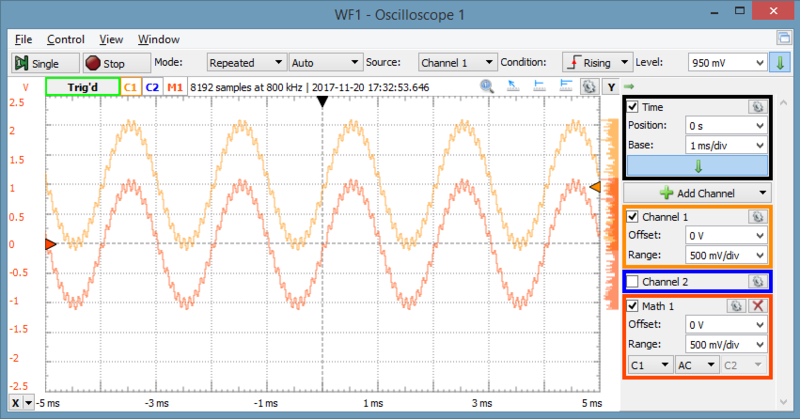 For example, this version is WaveForms 3.7.5. The first number indicates whether it is WaveForms 2 (Previously WaveForms Original or Legacy) and WaveForms 3 (previously WaveForms 2015). To check out how to see which version you have, read this post. There is also a visual cue from the logos. 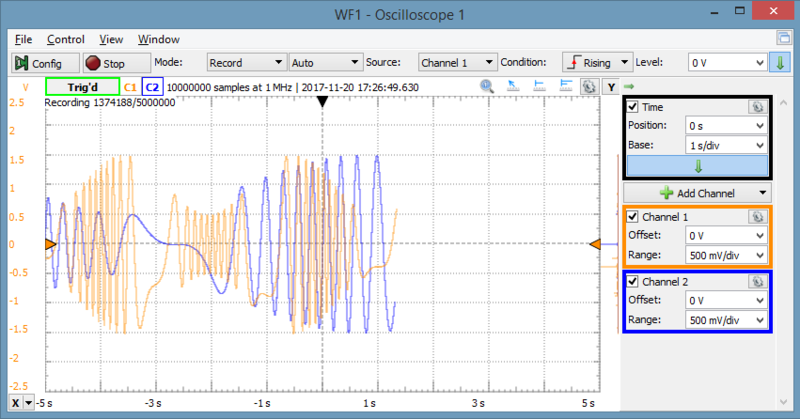 For more information on this version of WaveForms or to view the full changelog, go to the downloads page on the Wiki. 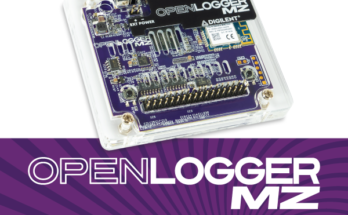 If you have any questions about this new version or anything WaveForms post on the Digilent Forum!